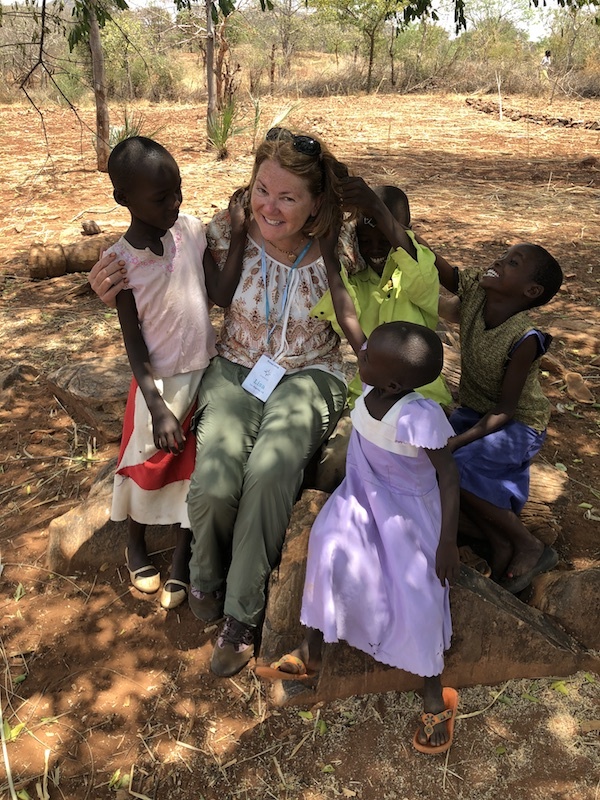 Making friends in Tharaka County - my hair is very interesting here! Today’s journal entry will be short, as our visit to remote Tharaka County had us on the bus and walking dirt roads for many hours. I’m tired, very tired… but it’s a joyous kind of tired. The condition of pasture and browse ranged from fair to poor and the situation was deteriorating. Livestock body condition for both cattle and goats varied from fair to poor and the situation was also deteriorating. Food Stock at households’ level are low ranging between 50-60% of their normal level due to poor harvest in most areas. Despite these dire conditions, the families of Tharaka did not hesitate to welcome us into their homes, feed us a beautiful lunch, and of course to serenade us with song and dance. With temperatures hovering in the high 90’s, we Sponsors recognized the challenging health conditions these families face on a daily basis. Repeated trips to the river to fetch water and to water, the livestock are a fact of life. A long, dusty walk to school is part of the day. The elders I visited must rely on the goodness of neighbors to collect water, help supplement their food and assist them with the two goats they own. Chicken eggs help supplement the diet of the husband, who has access to a national health insurance card to help treat his high blood pressure thanks to his Unbound sponsorship. Life in Tharaka seems so challenging. And yet these are men, women, and children who offer us ready smiles, warm hugs, and open arms. One of my favorite moments of the day occurred when a group of beautiful children sat petting my hair, fascinated by something that seemed so completely foreign to them. When language differences create a block to communication, pure love and new friendship overcome the awkward silence. So if allowing my hair to be petted brings a smile to a child who must walk miles to go to school, spend her day collecting water, and go hungry at night, I’m up for being petted. Thankfully, we can see firsthand on these home visits the difference that Unbound sponsorship makes in these homes. I hope that these posts are encouraging some of you to consider Unbound in your Lenten almsgiving. Even if you are unable to sponsor a child monthly, even a small gift to Unbound can go a long way in changing lives. If you are already a sponsor, I hope you will consider writing a letter to your sponsored friend this month. A consistent question we receive on home visits is, “Can you ask my sponsor to write me a letter?” I hope that if you are already a sponsor, you recognize the great blessing that you are in the life of a real family!